« WOW! New State Record Brown….out of Taneycomo! Pretty Day On The Water! Boy! A couple nice days then back into the dumpster! Mid 30s will be the high today and lots of overcast sky. Friday has low 50s with Saturday in the mid to upper 40s, but showers moving in for the afternoon and evening. Temps will take a nose dive then and we’ll see low 30s Sunday and low 20s! Monday. Shiver! We are still seeing them use four units to run the equivalent of two units. Release rate is usually 6700 to 6900 cfs range. Table Rock Lake is still sitting at 915.5 and Taneycomo is around 707.5 with this flow. Gina had Wednesday Jim on the water this past Tuesday. Beautiful day! Flow was at 6900 cfs, sun was shining and temperatures got into the mid or better 60s. Fish weren’t consistent with what they took, but they tried enough flies to pull quite a few nice fish out, including this beauty! 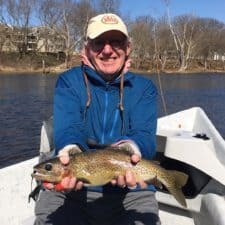 This entry was posted on Thursday, February 28th, 2019 at 2:04 pm	and is filed under Fishing Reports. You can follow any responses to this entry through the RSS 2.0 feed. You can leave a response, or trackback from your own site.